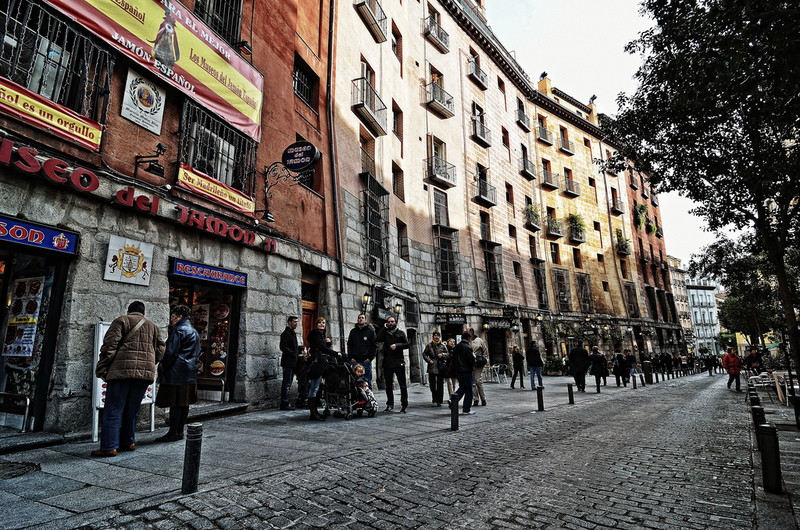 The traditional, bustling La Latina neighborhood in Madrid is known for its many tapas bars and restaurants. Locals and tourists alike can enjoy bar hopping from spot to spot any day of the week, but especially on Sundays after the famous El Rastro flea market. 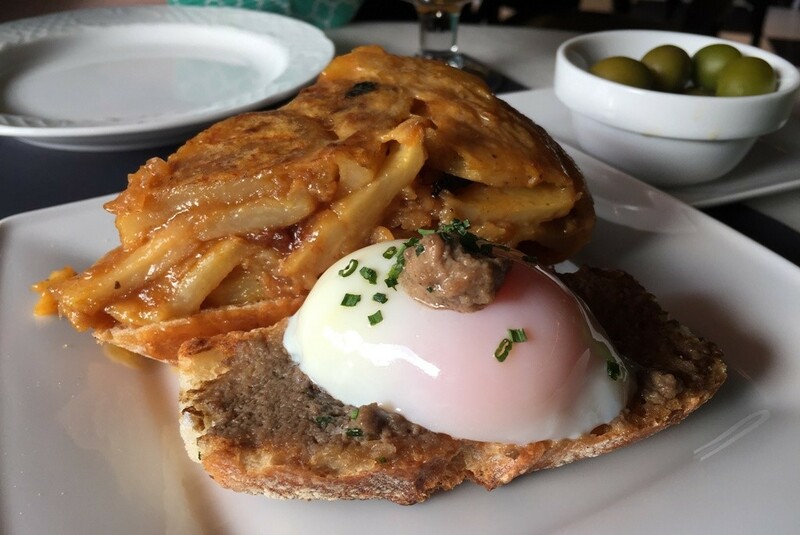 Here’s a guide to the ultimate tapas crawl in La Latina. This no-frills beer joint is the perfect spot to start your tapas crawl. Upon exiting the La Latina metro, you’ll find yourself in the Plaza de San Millan. 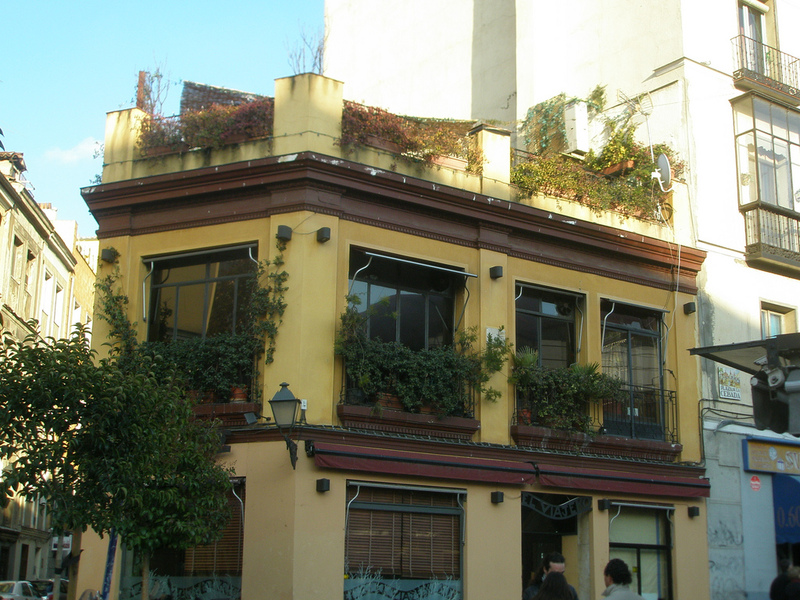 You can’t miss spotting the Cervecería de San Millan, a crowded, local spot with plenty of outdoor patio seating so you can enjoy those tapas and beers in the sunshine. 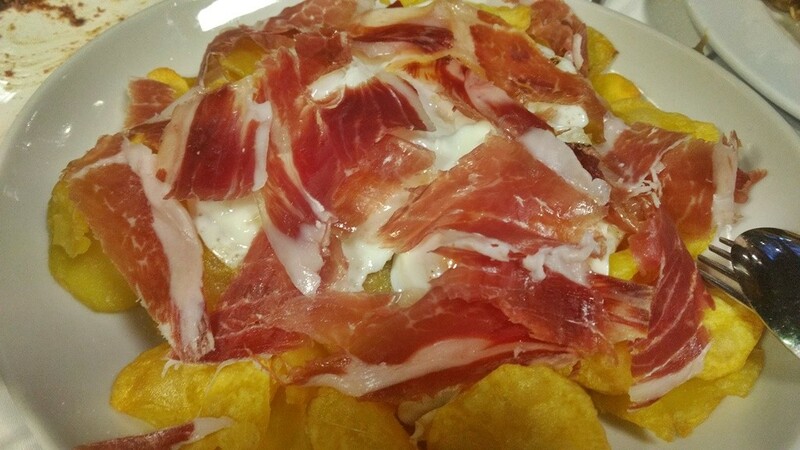 Typically, for each drink you order, you’ll get some potato chips or olives, and you can order a variety of tapas and raciones (bigger, sharable plates) too, like delicious huevos rotos or raxo adobado. El Viajero has three floors of tapas: the main floor, the more club-like first floor and the fancy rooftop with gorgeous sunset views. Super busy on a Sunday afternoon, the rooftop is the best spot to be, especially when sunset rolls around. Try a traditional tinto de verano drink (a red wine spritzer) paired with a tapa of the delicious Canarian specialty, patatas con salsa mojo. Note that the opening times given here are for the restaurant – if planning to visit the bar or the roof garden, check the website beforehand for their respective hours. It wouldn’t be a tapas crawl in La Latina without a visit to the neighborhood’s most popular food market, Mercado de la Cebada. The perfect spot to tapas-hop, wander from stall to stall, sampling whatever peaks your interest. Some delicious Galician-style octopus with paprika or a typical bocadillo de calamares are tapas that you can find here. 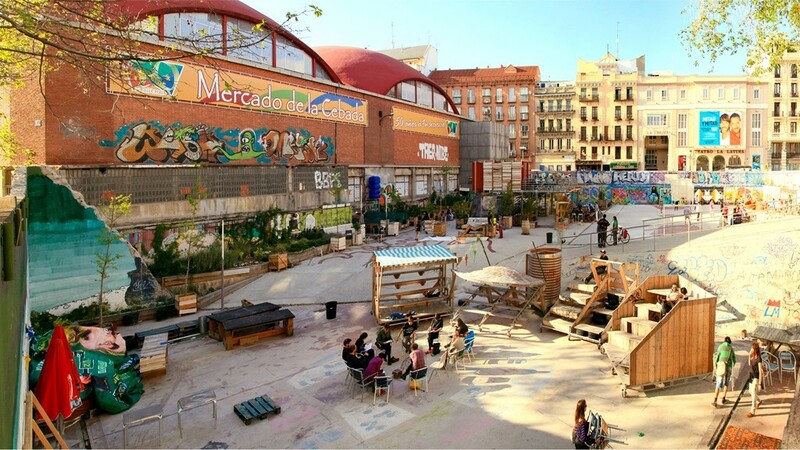 Plus, the street art and outdoor courtyard is fun to explore on a sunny day. 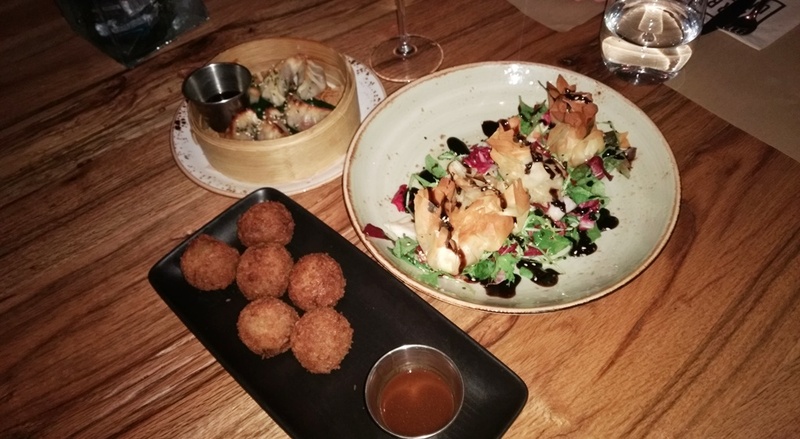 A slightly fancier spot for tapas, Juana La Loca has the traditional favorites as well as some contemporary takes on more authentic varieties. Expect to see all the Spanish stalwarts like omelette or croquetas, but don’t be surprised if they include ingredients like cabrales cheese or truffle. The dishes are often fused with more international offerings, like ravioli or soft shell crab. A stones throw away from Juana La Loca is Txirmiri, a Basque-style bar serving up delicious pinchos. Some of the best items on the menu include the grilled foie with fig marmalade and sea salt or the oxtail stew. Regardless if you stand at the bar or eat at one of the tables, the tapas, which in most places are a small portion, are decidedly bigger at this joint. This is a street and not a bar, but it’s certainly a great spot to wander down when doing a tapas crawl. In typical Madrileño fashion, the street is lined for blocks with tapas bars and small restaurants, perfect for eyeing and sampling new foods. Wander in and out of these little bars and order whatever looks good in the glass tapas cases set atop the bar. If you’re full, just people-watch and take in the whole scene.